You Said it, Diane Keaton! I must admit Diane Keaton made me livid at first. It’s what she said about the part of London in which the film Hampstead is set. For my money (there’s less of it since I moved to Hampstead, mind), this neighbourhood has the lot. Yes, it’s congested as well as expensive, and you can forget about parking. But I’m sticking up for Hampstead. For one thing it’s cosmopolitan. Ambling down the High Street last week, I heard no fewer than eight languages spoken. NW3 is liberal, inclusive, and intellectual, with a rich literary heritage that takes in writers as varied as Keats and Ian Fleming. There is, in Keaton’s words, “nice architecture”. The streets are also awash with blue plaques, as anyone can see on a short stroll – details here. Hampstead’s renown goes back a long way. John Constable moved his family here in 1827 as the area was said to have cleaner air than Suffolk. He lived in Well Walk, where he found he could unite a town and country life. His bones now rest in the graveyard of St John’s parish church, a cemetery crammed with notables. 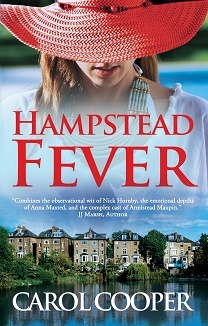 Hampstead Heath, where the squatter of the film lives, is an ancient parkland of 320 hectares. It’s an oasis of biodiversity and an area for sports. From here there’s an impressive view of London. The Whitestone Pond at the top of Hampstead Village is technically the highest point of the capital. Even if you don’t set foot on the heath, Hampstead is a delight. There are great pubs and it’s a foodie’s paradise. I don’t know where the scriptwriter shops, but I’ve yet to spot a shrivelled apricot in Waitrose. You want unusual? This is Britain, yet open-air swimming on Hampstead Heath is legendary, with its ladies’ and men’s ponds being the only life-guarded open water swimming places available to the public every day of the year. And how’s this for offbeat advertising in the heart of the village? Just take a card from the little box near the top. On reflection, however, Diane Keaton was right when she said Hampstead was nothing special. But I reckon she meant the film, not the area. The movie’s basic premise – a well-turned out widow falling for a man who literally pops out from behind a hedge – is flawed, the hermitic heath-dweller is improbably hygienic, and, if you’re generous, you might call the acting uneven. Worse, I found the character of Emily Walters irritating. She looks terrific (this is after all Diane Keaton), but she’s vacant and ditzy. Emily admits to being bad with money, so no wonder she can’t make ends meet. She seems to have no education, occupation, or aspiration, and her “personality” can be summed up in two words: goofy grin. She does however deserve a Brownie point for working in the Oxfam shop, and perhaps some credit for raising such a presentable son (James Norton is always easy on the eye). Hampstead the area deserves better than Hollywood pap.